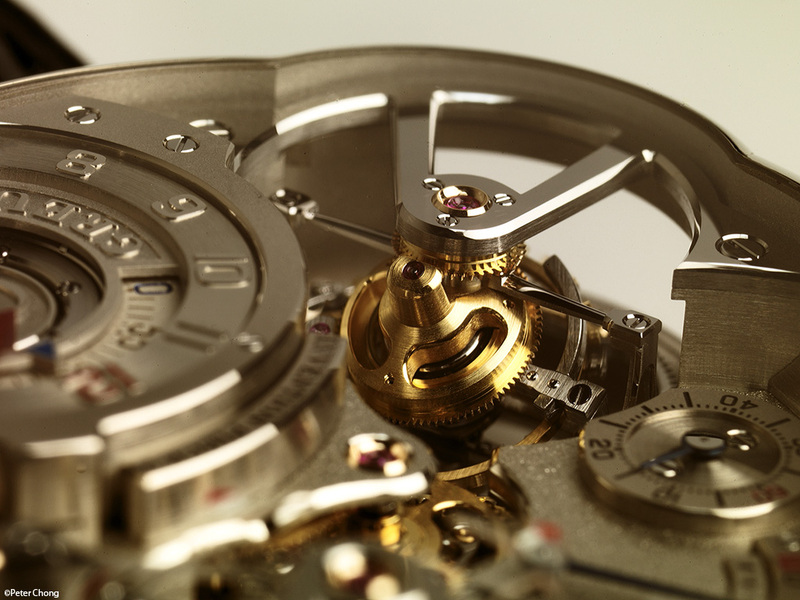 Greubel-Forsey recently welcomed an investment by Groupe Richemont for 20% of their company, and we await to see how this will turn out in the speed and intensity of future developments in their watches. But as mentioned elsewhere, Richemont management tends to leave the companies they acquire more or less intact, allowing them to retain their original DNA, even within the group structure. As part of their grand strategy, GF have charted the course of their firm with what they call a series of 6 inventions...not all are realised in watches yet. But some of them have been made into beautiful timepieces. For SIHH 2011, they released a new version of the Invention Piece No. 2. Already a magnificent timepiece...this watch is rather large, but the movement layout and design is even more wonderful and beautiful. Robert and Stephen's eye for beauty is unmistakable. The dial shows two double tourbillons, one at the traditional 8 o'clock position and another at the traditional 2 o'clock position. Each double tourbillon features an outer tourbillon which rotates at the rate of one revolution every 4 minutes in which another tourbillon, inclined at 30 deg angle makes one rotation every minute. Two doubles make a quadruple. 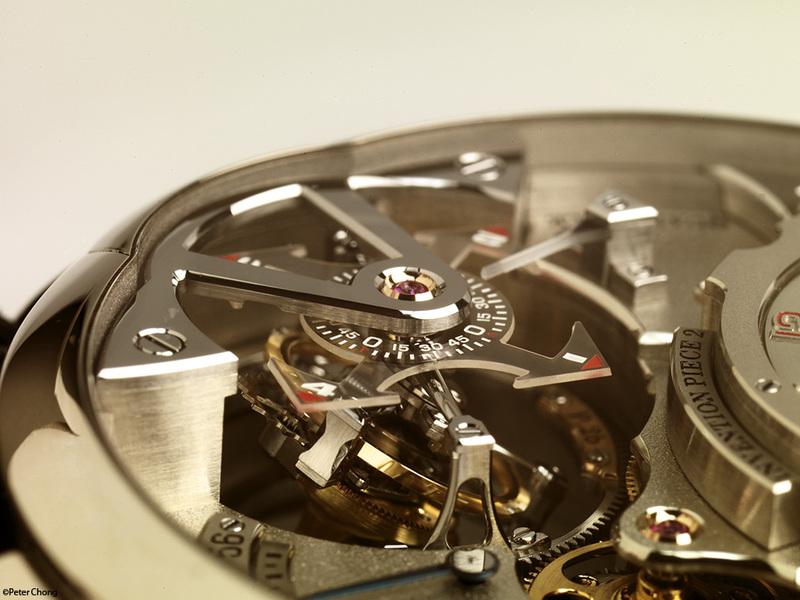 The dial itself, shown below in detail, is a masterpiece, here is a closer look at the time telling business side. The red hand showing the hour indicator and the blue triangle mounted on a rotating disk to show the minutes. I find the play of colours to be beautiful...the gleaming silver finish of the plates...frosted, and spotted with polished bevelling, the brass of the tourbillon wheels, the splashes of red provided by the jewels and the markers. Splendid. 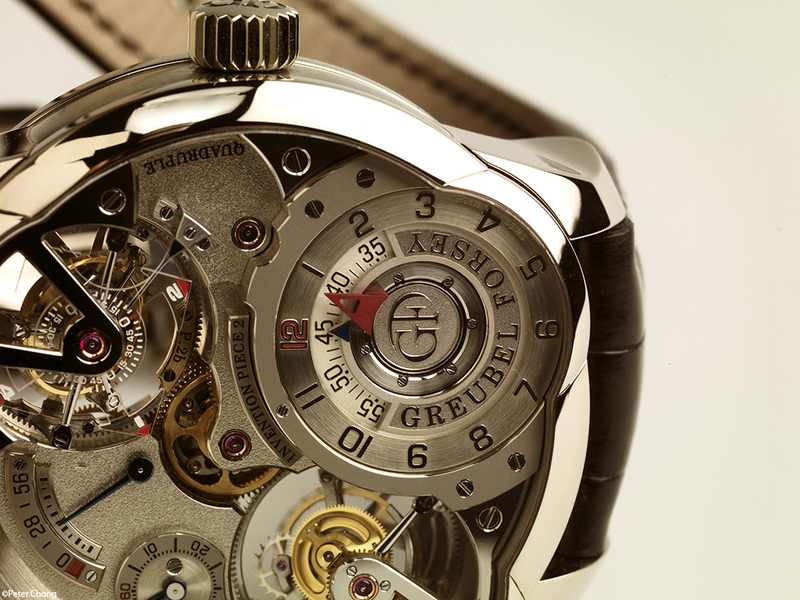 The two double tourbillons are driven simultaneously by a spherical differential gearing system, seen in the center. Multi-layered to provide a landscape feel...much like traversing a city, with many levels to show off the beautiful finishing. Great technique. 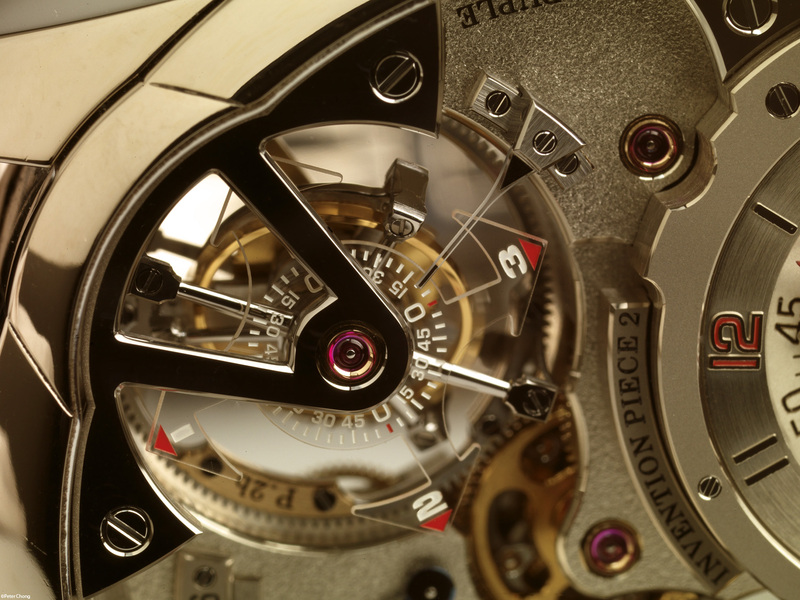 The photograph below is a closer look at one of the two double tourbillons in their own bridges/arms, and the sapphire disk which is fixed onto the outer tourbillon and carries the 4 minute indicator. Note the A shaped tourbillon bridge for the 4 minute outer tourbillon and the more traditional straight bridge for the inner minute tourbillon. Another closeup of the other double tourbillon, showing the pinion of the outer tourbillon being driven by the fixed wheel on the upper arm. Note the finish of the bridge, which is hand bevelled, flat black polished with polished counter-sinks. 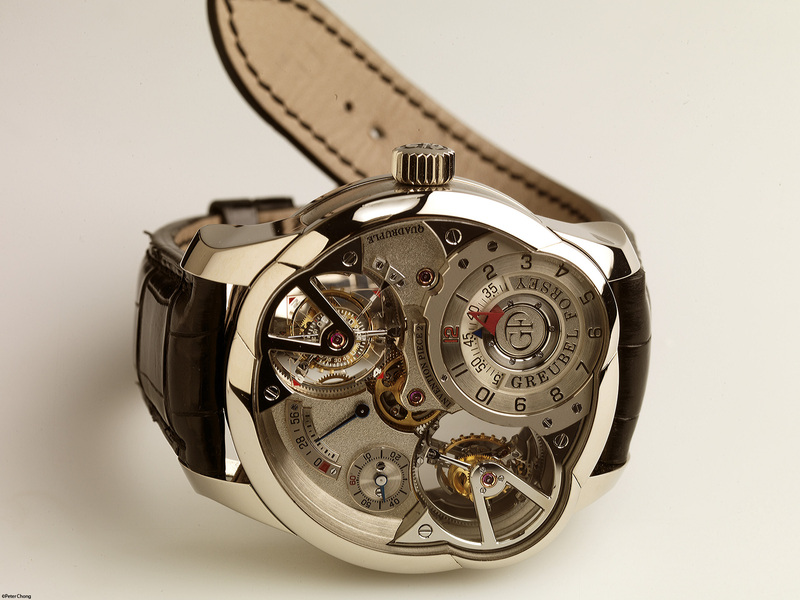 And yet another look at the double tourbillon...I just cannot get enough of this. But believe me, this one is truly mesmerising watch...two tourbillons going on its own rounds, and within a vibrating balance wheel. Amazing. The back of the Invention Piece No. 2 is inscribed with a message meant only for the owner, so I have made sure that this special pleasure of reading the message is enjoyed only by the owner. The depth of field of the medium format system helps here. 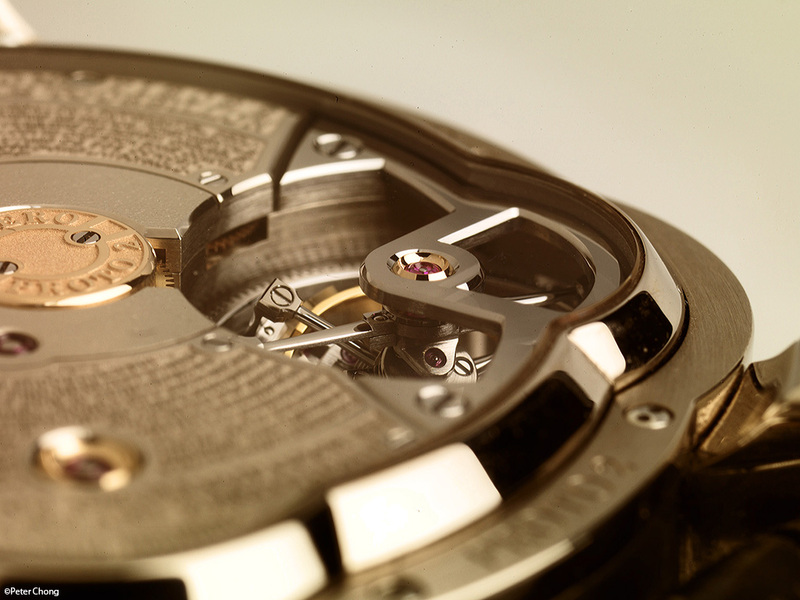 Here is a picture of the rear of the watch, showing the back of the tourbillon bridge.